Premier boss stands down with Michael Ryan ready to take his place. 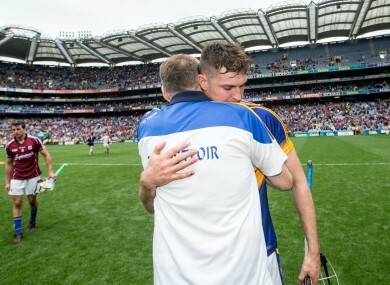 Eamon O'Shea consoles Seamus Callanan after Tipp's heartbreaking defeat. AN EMOTIONAL EAMON O’Shea said that his departure as manager will only be ‘a footnote’ in the story of this Tipperary team. O’Shea came close to tears when he spoke to the media following the heartbreaking one-point loss to Galway. It was the final act of his three-year term as Premier boss with his assistant Michael Ryan already ratified to step up and succeed him. “Tipperary is over for me,” he said. “Being involved with Tipperary is over for me. O’Shea took a second to compose himself before he reflected on the highs and lows of his tenure. I had my innings with Tipp. It was bloody, it was great. “We did what we could. We tried to play the game in a particular way. There are men in Tipperary who can carry this on. “I just feel that we gave it everything every time we went out. We tried to win. We didn’t always win. We were beaten by a point, beaten by three points. It doesn’t look great sometimes but we did our utmost to win these games. “I said to the players, the belief I have in them and the belief I have that they can continue and go on and grow better when I’m not there is really strong. Somebody else will go on and do this better than I did. That’s all you can do. “I’m old enough now to know that I had a real good shot at it. I had a real good shot and I really, really tried to play the game the way I wanted to play the game and the way they wanted to play the game. “In one sense I feel emotional. Obviously losing is huge. “But it’s theirs, it’s the players’ game. Me leaving is only a footnote. It will be only a footnote. “What’s really important is that we continue and we push and we try to go on and be better. “It’s about for them moving on and trying to be better and trying to be better. That’s what high level sport is. It’s a beautiful thing but it’s a brutal thing, and it’s both at the same time, and that’s the essence of what happened today. “But for them this is a beginning. We’ve nine players who won their first Munster final. They can go on and be better players. “We are defeated certainly, but it is them — they are the story and they are going to be the story over the next number of years. Email “Tipp boss Eamon O'Shea got very emotional in his post-match press conference”. Feedback on “Tipp boss Eamon O'Shea got very emotional in his post-match press conference”.